Unsurprisingly, there’s a lot of hype around Claret Sword Dragon Revolt this week. For September Shop Fights, September Woman’s Event Fights and Dragon King’s Awakening Commemorative Fights, participants get one of the past winner cards as a random present. One of the Winner Card+1 cards! ACT (RC): [CB1 & Retire this Unit] Look at the top 7 cards of your Deck, reveal up to 1 “Claret Sword Dragon” card, add it to your hand, then shuffle your Deck. If you have a “Claret Sword Dragon” Vanguard, draw 1 card. CONT [Deck] GB1: If you have a Grade 3 or higher “Claret Sword Dragon” Vanguard, this Unit’s Grade-1. AUTO (RC) GB1: When this Unit is Boosted by a Grade 1 Unit and attacks a Vanguard, during that battle, this Unit gains Power+5000. AUTO (VC) GB1: When this Unit is attacked, choose 1 of your Grade 1 Rear-guards, you can move it to (GC). If you move it, and you have no Rear-guards, during that turn, this Unit gains Power+2000. 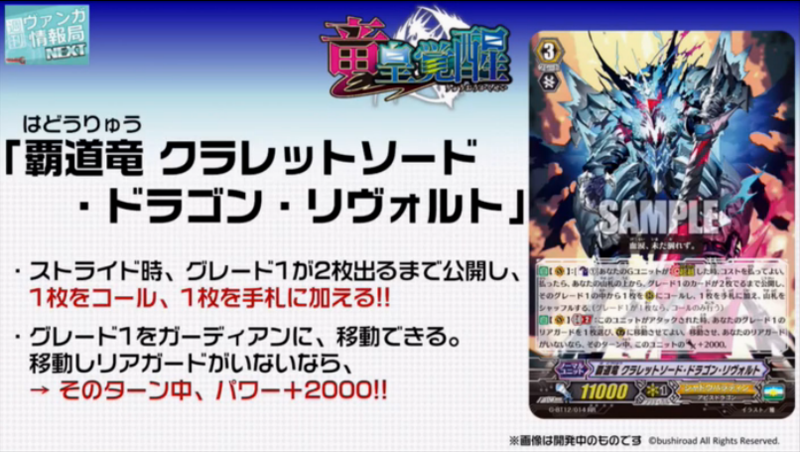 AUTO (VC): [Choose 1 card with the same name as this Unit in your G Zone, flip it face-up] When your opponent calls a Sentinel or G Guardian to (GC) OR this Unit’s attack hits a Vanguard, you can pay the cost. If you pay it, search your Deck for a number of Grade 1 or lower cards up to the number of face-up cards in your G Zone, Call them to separate (RC), then shuffle your Deck. Next week will feature a fight between Kazuma and Kumi’s Voice Actors.